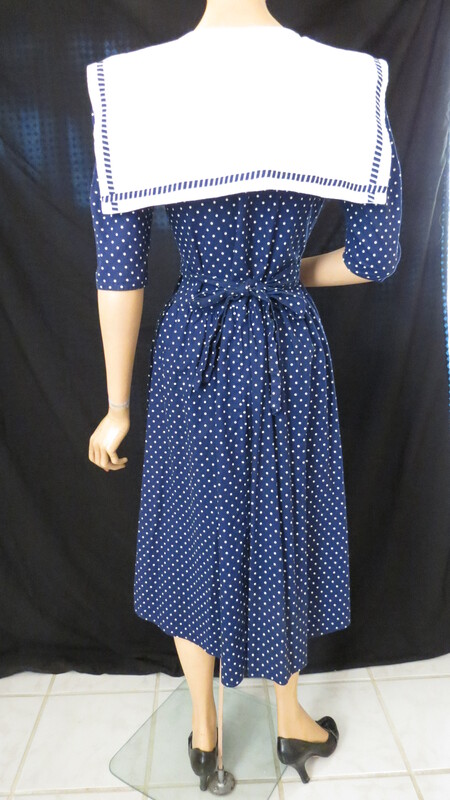 TRUE VINTAGE DRESS WITH SAILOR COLLAR. NAUTICAL STYLE IS CLASSIC! This time it’s Seventies Does Forties, in 100% cotton. No matter what decade you’re in, navy and white, polka dots and nautical themes are always part of the shoulder season style line-up. 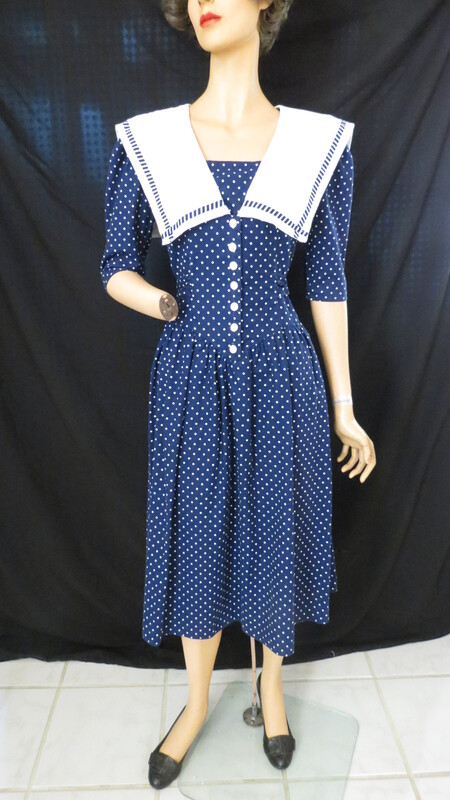 The designer, Robin Gayle, has the collar and waistline down – those huge collars were really popular for a while in the Forties and on into the early Fifties. I’ll show some more later. With a nice midi hem, too. Get your pert little hat and let’s go! . . . . .
Posted on October 8, 2017 by Morgana Martin, the magicvintagespy. This entry was posted in '70's, clothing, day dress, dress, fashion, find, frock, nautical, retro, sailor, true vintage, vintage, vintage blogger, vintage clothing and tagged '40's, '70's, 1940s, 1970's, 1970s, 40's, clothing, day dress, dress, fashion, find, forties, Forties, frock, ladies, nautical, retro, sailor, seventies, Seventies, Spring, spring, true vintage, vintage, vintage blogger, vintage clothing, women's. Bookmark the permalink.